It is a well-known saying that a business partnership is a lot like a marriage. Unfortunately, just like marriages, partnerships can fail. In fact, some statistics say that 50% of both end in divorce. When they do, it is best for everyone to make it as amicable as possible. Business partnerships end for a variety reasons: personality conflicts, different styles of doing business, financial difficulties, new goals or lifestyle changes for one of the partners. 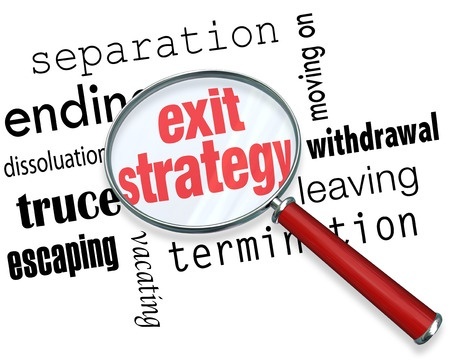 As long as you haven’t had a huge falling out, your exit strategy can ensure that your interests in the business are protected and that you leave with a favorable reputation. As with any relationship, communication is the key at every step – including when you choose to end the partnership. Your business partner should not be surprised when you decide you want to move on. If they didn’t already know that your goals were shifting or that you were discontent, you start the proceedings at a disadvantage. Communicate along the way. And, when you do decide to tell them, don’t use email or a phone call to avoid the tough conversation. A sincere face-to-face interaction will be best. As well, if you know you want to move on, don’t wait too long to start planning. Ending a business partnership is not an overnight process, so keep a time-line in mind as you determine what works best for you. There are several options to consider for terminating the partnership. Start by having a brainstorm session with a few of your trusted advisers on all the options. Two things will help this brainstorm. First, review your owner’s agreement. Before you went into business, you should have prepared an agreement. Revisit the document in detail so you know if possible options are already outlined. Second, determine the value of your business and what the financial ramifications are of selling or leaving the business in general. Obtain a personal attorney. You won’t be able to use the company attorney because it would be a conflict of interest. Find a new attorney who will work with you exclusively. Have them go through all the details with you and coach you on possible outcomes, and then keep the attorney in the loop at every step of the way so that she can continue to anticipate and coach. Consider all paperwork that needs filing, as well as all accounts that need closed. Make sure that all debts are all paid off, settled, or transferred to the new owner. Follow-through on whatever you have agreed upon, taking care to meet every financial obligation and other milestones on time. Finally, once everything is agreed upon, announce it to your staff. Help stem any gossip by setting the record straight by telling them that you and your partner have agreed to go separate ways and what the plan is going forward. If the business is going forward without you, the change in leadership can be scary for your staff, so this is a critical time to show your confidence. The Orlando Law Group Launches New Title Company Is a Franchise Right for Me?